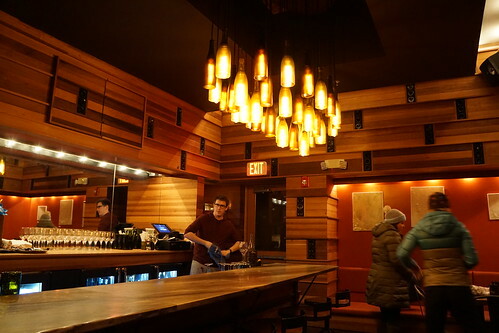 The popular Bergamot Restaurant opened a more casual sister restaurant near my apartment in Inman Square. 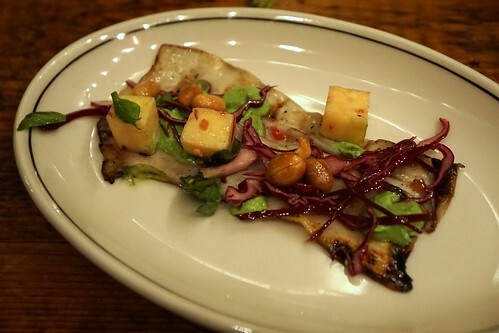 I had walked past BISq many times in Inman Square, and I finally had the perfect opportunity to try it when I saw a Groupon for a 6-course tasting menu for $30 per person! I hadn't used Groupon for a while but recently I took a look around and saw that they actually have some great restaurant deals in Boston. I convinced my roommate to join me for dinner one night . 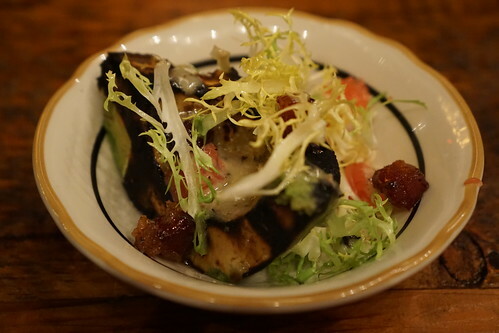 I love avocado so this was a great starter for me, but the star of the dish was really the salumi jam. Yes, really, it's "jam" made with salumi instead of fruits! 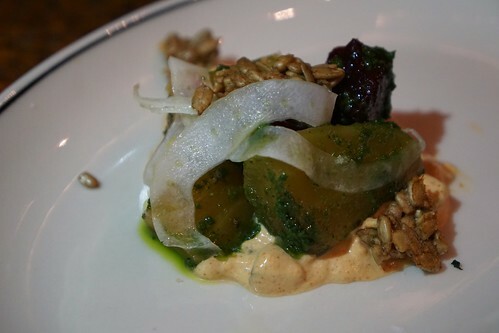 It was unusual to have beets paired with spicy flavors as in this dish. This was my favorite dish of the night. A thin slice of king oyster mushroom is topped with small cubes of egg omelette, peanuts, and a bold queso verde. Desco is a gorgeous new restaurant in Oakland from Donato Scotti who owns Donato Enoteco in Redwood City, serving house made charcuterie and pastas. It's quite the charcuterie plate for $10! 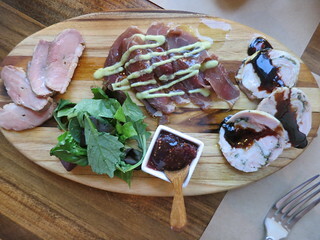 The lamb prosciutto was aged for 3 months and the rabbit terrine was drizzled with extra vecchio (extra old) balsamico. 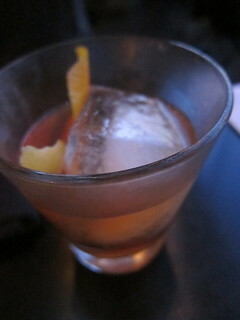 There's a small list of classic cocktails ($10 each), but they're made well and included drinks like Pegu Club. 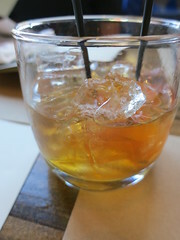 The Old Fashioned was quite nice and they have a good selection of gin and whisky. The thing you must get here is the handmade Casonsei ($12). Casonsei is a type of filled pasta from Bergamo in Lombardi region, where the chef is from. 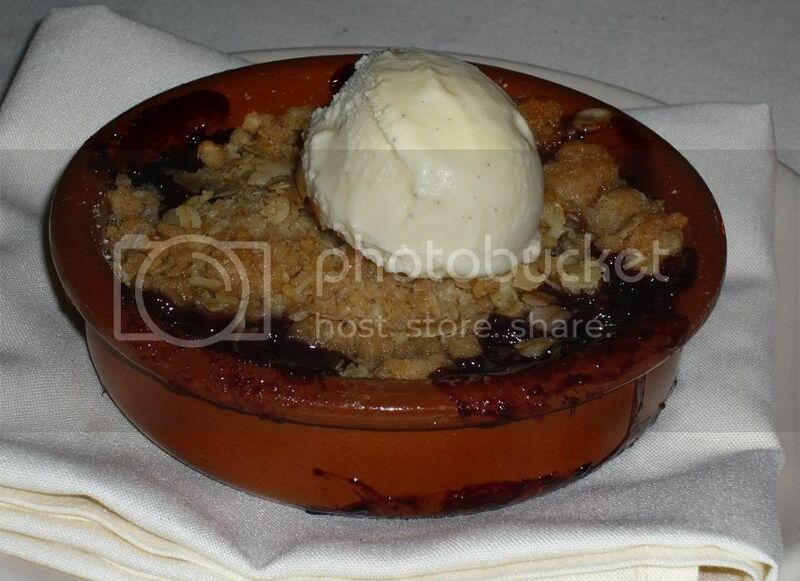 It is filled with pork and amaretto cookie crumbs, then topped with brown butter and guanciale. I absolutely loved it. The pasta had very nice thickness and texture. 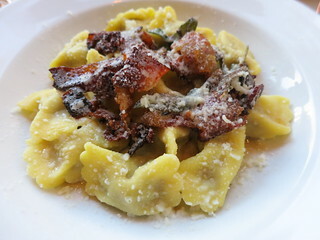 The pork inside is very tender, perfect with the crispy guanciale. This pasta was so delicious, I couldn't stop eating despite having another entree coming ..
Big changes are taking place at The Churchill in West Hollywood. Chef Bruce Kalman (formerly of The Misfit, Urbano Pizza Bar) is taking over the kitchen, and Mia Sarazen (Harvard and Stone, Black Market) has created a whole new cocktail menu ($12 each). It's only been a couple of months, but The Churchill Old Fashioned (Old Fitzgerald Bourbon, house bitters, sugar) has already been touted as the city's best. 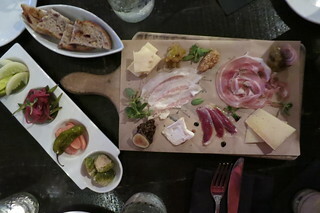 The charcuterie section features plenty of housemade products including pancetta, duck prosciutto, coppa picante. The cheese selection is small but excellent. Try the Hopscotch cheddar from Fiscalini in Modesto or Glacier goat cheese from Drake Farms in Ontario. 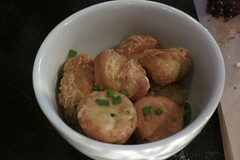 The warm Gougeres with gruyere and garlic chives ($6) are dangerously addictive, I couldn't stop popping one in my mouth. 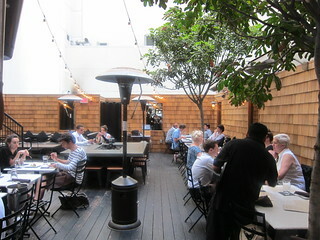 Fact: Wood and Vine has one of the best al fresco dining area in Hollywood. Insist on a table here as long as the nights aren't too cold. It's a quiet escape from the craziness of Hollywood Blvd. When Wood and Vine first opened, the executive chef Gavin Mills had to figure out how to work with the tiny kitchen and now he's got it down. The kitchen is so small it has no walk-in fridge! But that just means Chef Gavin goes to the market every morning for fresh ingredients. 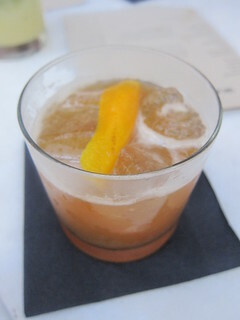 At a recent dinner, I started my night with a Chai Gold Rush (chai and vanilla infused bourbon, lemon, honey, $12). 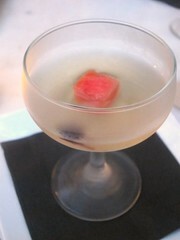 This was a great cocktail, probably my favorite of the night! It's not overwhelmingly "chai"-like, just notes of spices. I hope they keep this one on the menu for a while! 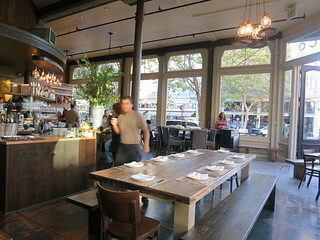 Mondays are good to give Wood and Vine a try with their Monday Market Prix Fixe menu, $18 for 3 courses. 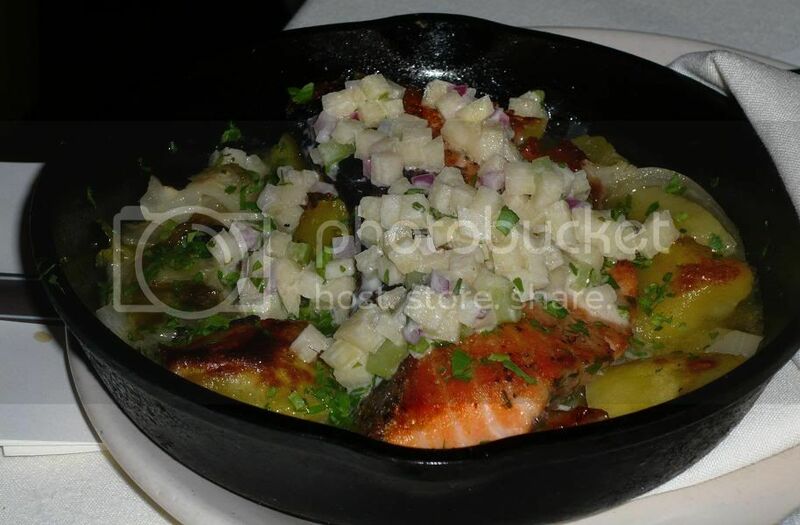 There were three of us dining, so we tried one of the prix fixe menu while ordering other items to try. 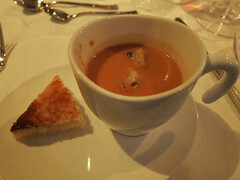 The first course was a Melon consomme with basil. This was a rather interesting first course. It was cold (good for the summer) but since it's also sweet, it was more like drinking melon juice rather than a consomme. The current menu has plenty of Southern items (as you'll see more below, chicken and waffles being one) and he's also doing a Southern Sunday suppers. I lived in South Carolina for high school and developed a liking to grits. 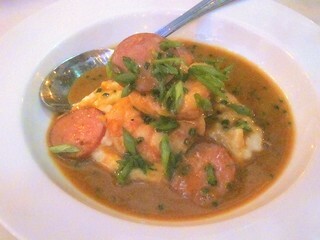 I liked the shrimp and grits here, especially the texture of the grits and the addition of the housemade sausage. 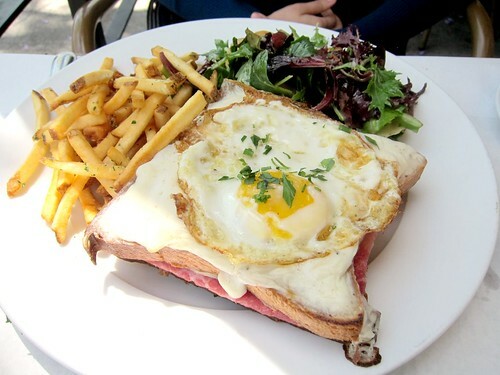 Le Saint Amour has been a bloggers' favorite ever since Chef Walter Manzke started consulting for this Culver City bistro. While I have yet been lucky enough to dine while he's in the kitchen, I was recently invited for lunch. It was a nice day so we sat on the patio, overlooking the beautiful city hall. I had to order the Duck Confit Salad ($14) since duck confit and cherries sounded too good to pass up. 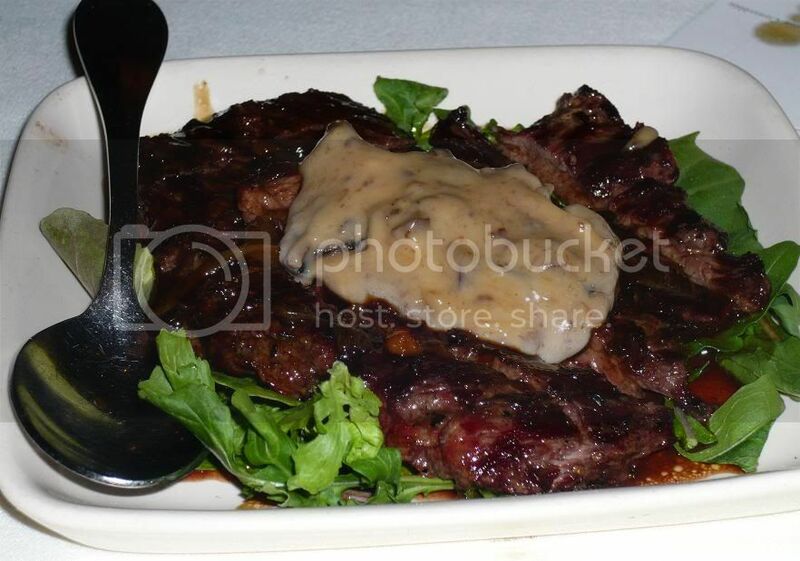 Don't order this expecting a light lunch though. 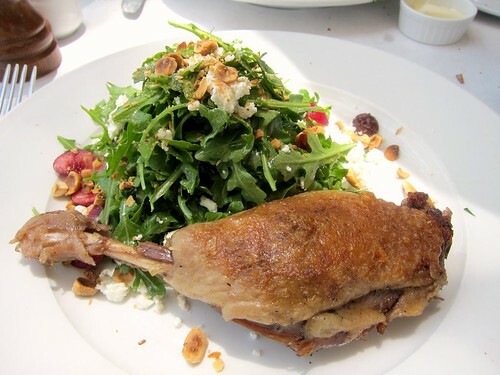 The duck confit salad at Petrossian comes with shredded duck confit integrated into the salad, but here the "salad" comes with an entire crispy duck leg along with arugula, cherries and hazelnut vinaigrette on the side. They rotate around the fruit in this duck confit salad, and the PR rep accompanying me said previously they only used dried cherries. 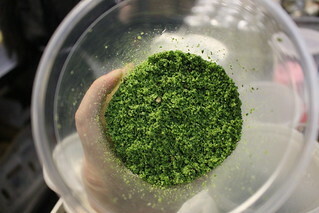 When I had it, the salad has both dried and fresh cherries, which I loved and balanced the bitterness of the arugula. The duck confit itself was well cooked: crisped skin and juicy, gamey flesh. The salad counters the richness nicely. 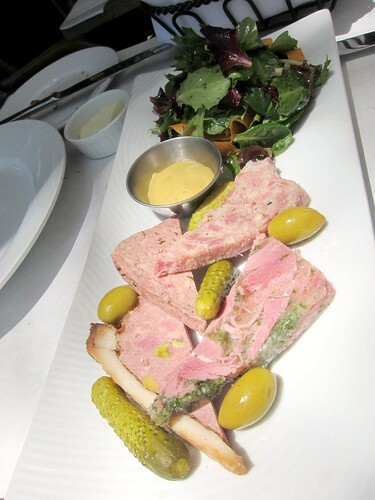 One of Le Saint Amour's co-owners/chef, Bruno, makes his own charcuterie: rillettes, pate, and terrines. 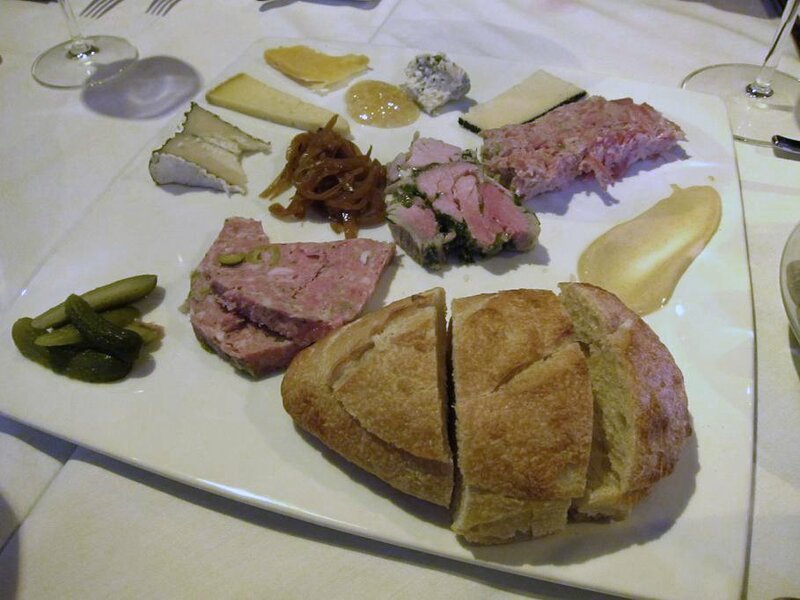 We shared a plate of Pork Rillette, Venison Galantine with Pistachios, Country Pate, Persille in gelatin. The pork rillette is definitely my favorite, with its melt-in-your-mouth richness, but I also enjoyed the novelty of the venison with pistachios. 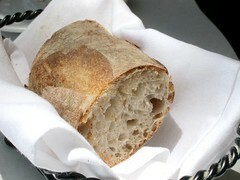 They serve a nice bread made by Bread Lounge, a bread artisan in downtown LA. 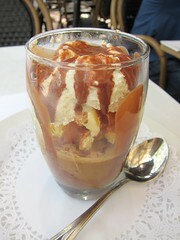 Like an affogato on steroids? 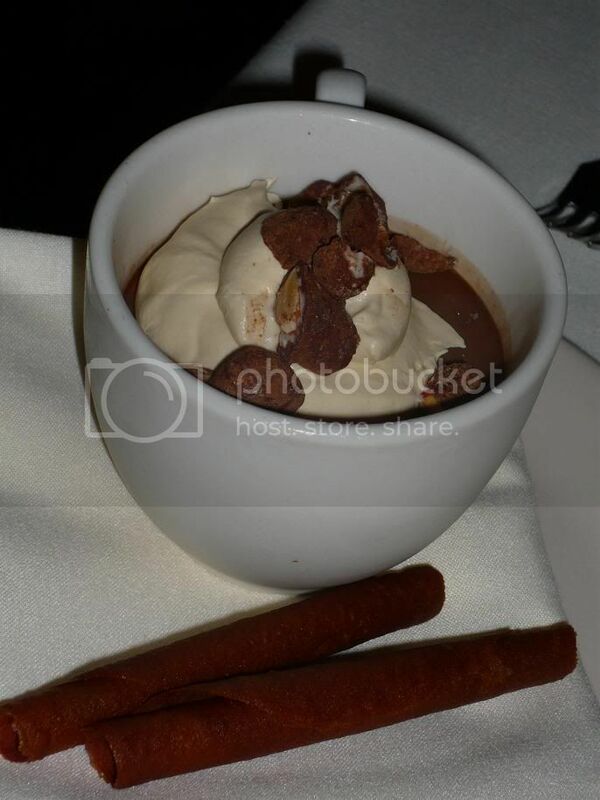 The cream and chocolate made this a rich and heavy dessert. Nothing wrong with chocolate and ice cream, but in terms of an afternoon pick-me-up, food coma wins over the caffeine here. I still need to come for dinner when Walter Manzke is manning the kitchen (I hear it's on Friday nights), as I've heard it would be one mind-blowing experience, but if my lunch was any indication, Le Saint Amour is still a solid dining destination even when he's out. LA & OC Foodie asked if I wanted to join a dinner in Newport Beach on a weeknight. Eh ... kinda far ... but then he said that the space used to be Blanca, which was where I first met him along with other bloggers for a Foodbuzz-hosted dinner. inomthings and RumDood are coming also, he said, both of them I also met for the first time at Blanca. Oh! It's like a mini foodbuzz reunion at the exact same spot (though different restaurant now). We were also joined by Hey Hey Scenesters and e*starLA. 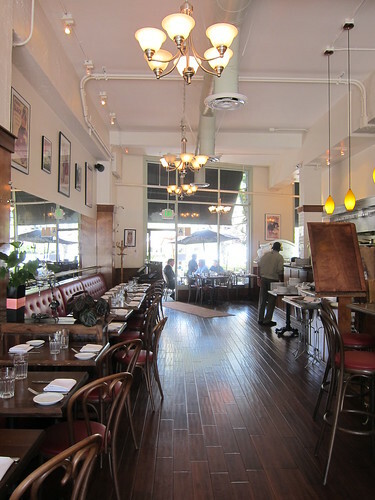 That Blanca space is now Lido Deck, a new restaurant helmed by Chef Don Schoenburg, formerly of Leatherby's Cafe and Tradition by Pascal (which I remembered reading a good review by LA&OC Foodie). Though the space is right by the water and there are plenty of outdoor, water-side seating, as luck would have it, it was raining and freezing that night, thus we were seated inside one of their dining areas. We started with a Charcuterie platter, all made in house: rabbit rillette, duck & olive, pork & parsley terrine. Cheese: Humboldt Fog, 18-month dry aged Gouda, Spanish blue cheese (made from goat, cow & sheep), hard Tres Leches cheese from Northern Spain. Accompanied by honeycomb from Santa Monica Farmers Market. 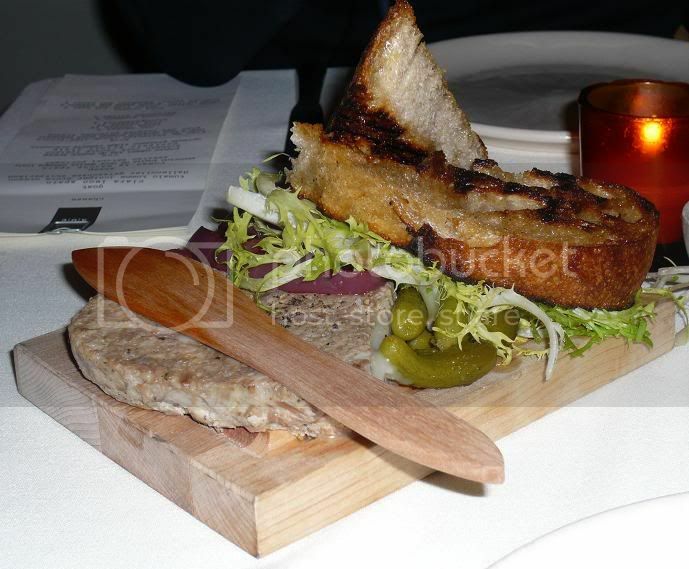 I liked duck & olive terrine but my favorite was hands down the rabbit rillette. As for the cheese, I particularly liked the hard Tres Leches, especially with the honeycomb. The platter was paired with a crisp 2008 Round Hills California Chardonnay. 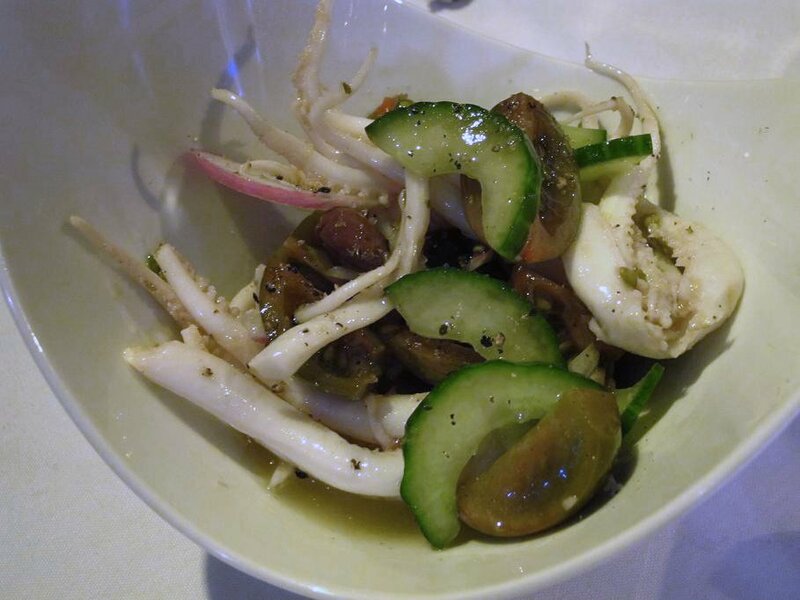 New Zealand calamari, english cucumbers, black jewel heirloom cherry tomatoes, kalamata olives. The squid was meaty, chewy, and firm. 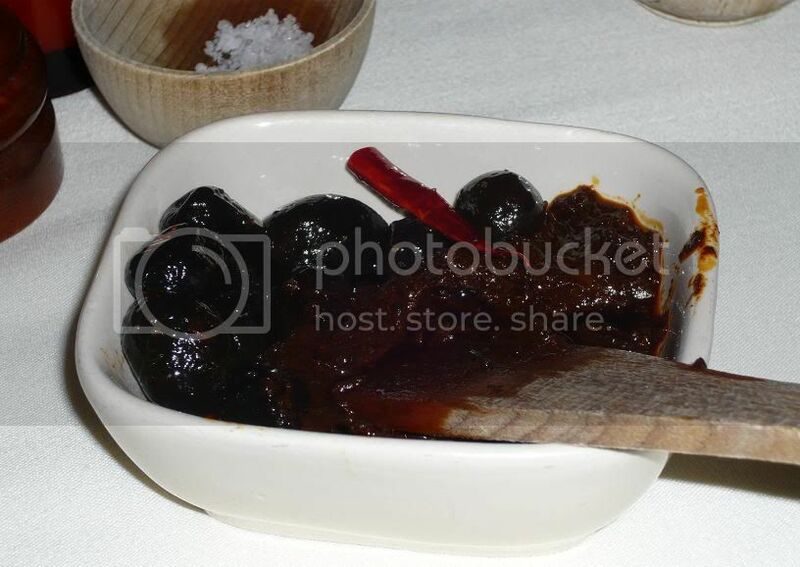 The black tomatoes may look funny and unnerving at first but it was actually firm and crisp and had a lot of juices. 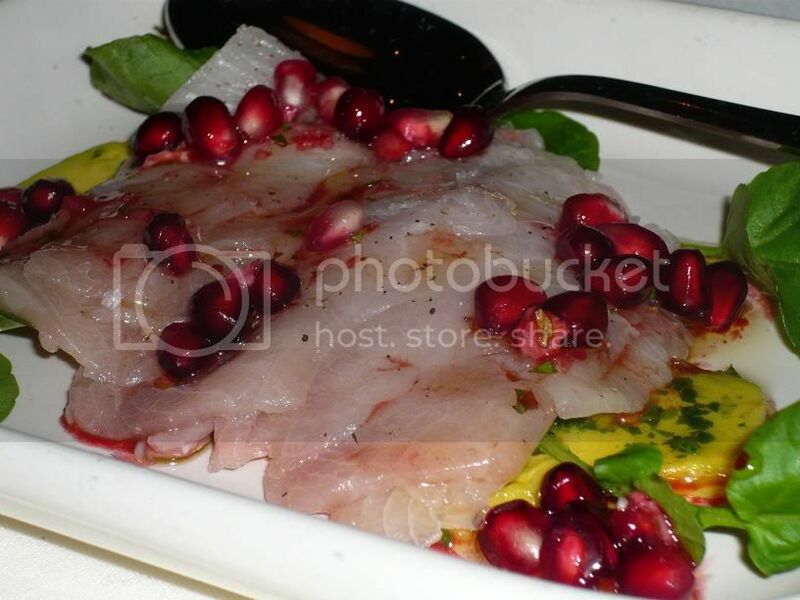 This was a nice and light dish to cleanse the richness of the charcuterie platter. The shrimp were rubbed with Chile, pepper, and cayenne. 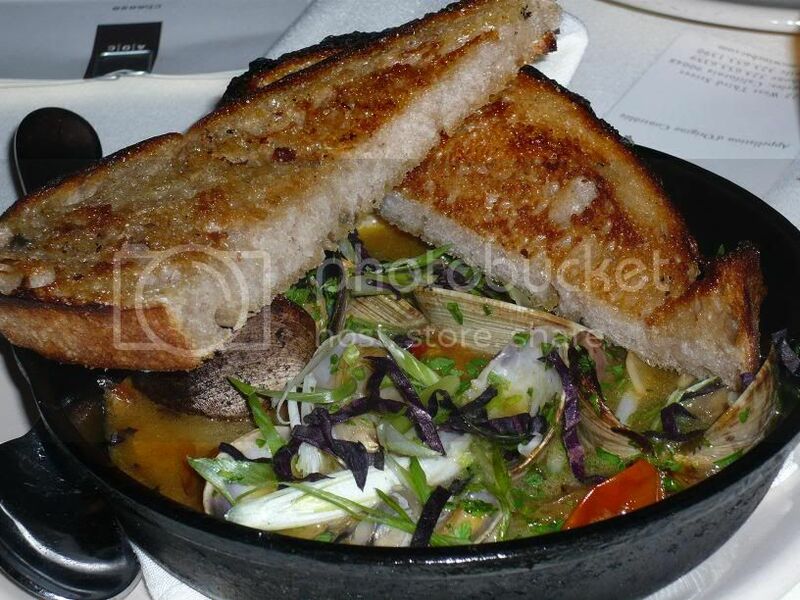 The idea for this dish was for a beer-friendly dish, which it certainly was. It was on the spicy side for me though (working on it, I promise), but the others seemed to like it. We then move on to the "main entrees" (not that we're not already getting full! :P ). Cinnamon rub pork tenderloin w/ ratatouille, sweet corn polenta, with red mole. 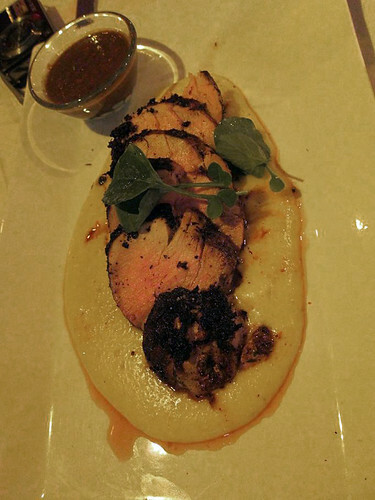 The pork was well prepared, very tender and goes well with the sweet, flavorful mole. Scallop, bacon, white truffle foam. Braised escarole. 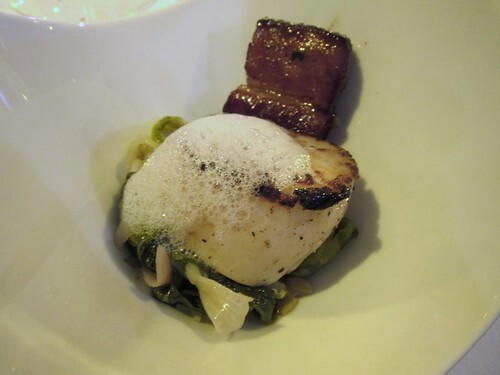 The scallop is nicely seared and the bacon is a pretty tender and fatty slab. 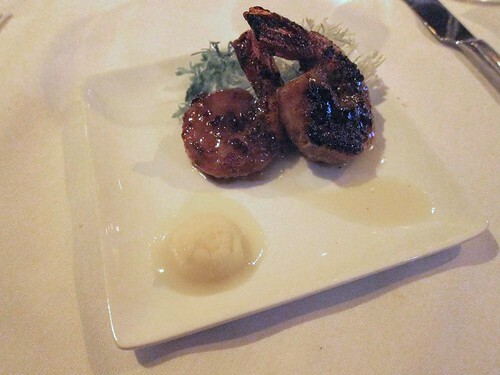 This is a revved up rendition of "bacon-wrapped-scallop" that is a tad decadent. Luckily the braised escarole helped balance it out. 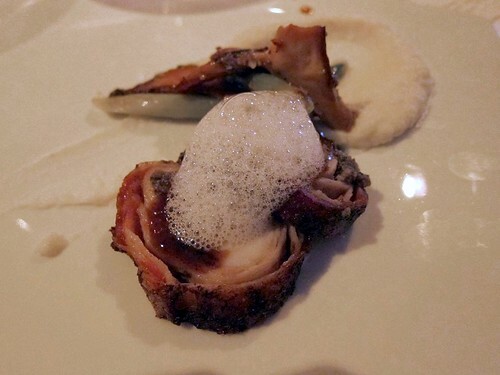 Braised rabbit roulade, asparagus, chanterelle, celery root puree, white truffle foam. The roulade was a rabbit tenderloin stuffed with mushroom salad (it had a nice fatty skin too). 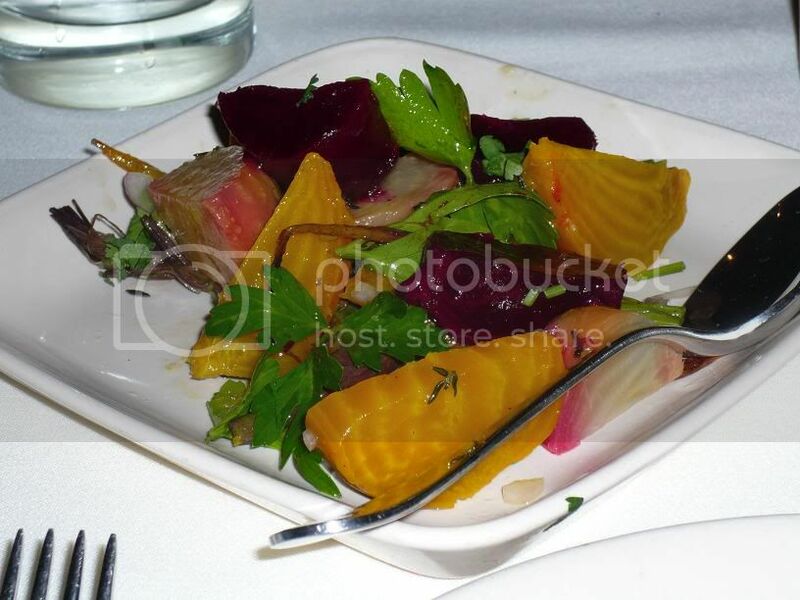 My only complaint was that the celery root puree was too cold. The white truffle foam shows up again here, but in both dishes I feel that the flavors of the rest of the dish overpowered the truffle foam, making it perhaps unnecessary. 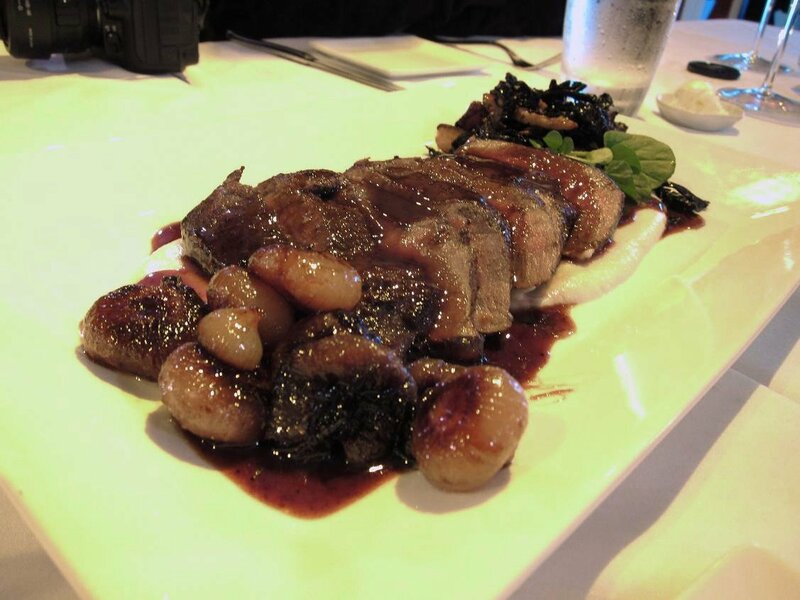 We had another game meat entree in order: Venison, honey glazed, red wine reduction, root cauliflower puree, cippolinis. We were so full at this point that we couldn't finish it. The venison was so good though, tender and pink in the center and just a bit gamey, the way I like it. I was sad to see them take away the uneaten pieces, but I couldn't fit any more. 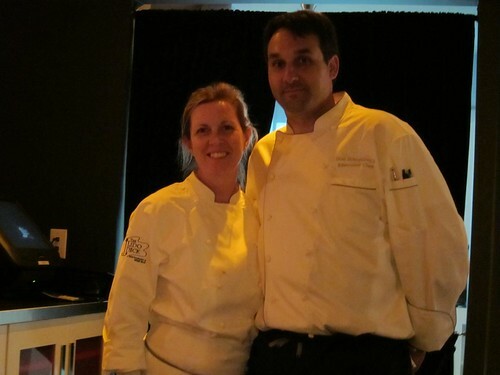 We all shared a plate of four desserts, made by pastry chef/wife Christi Carter. 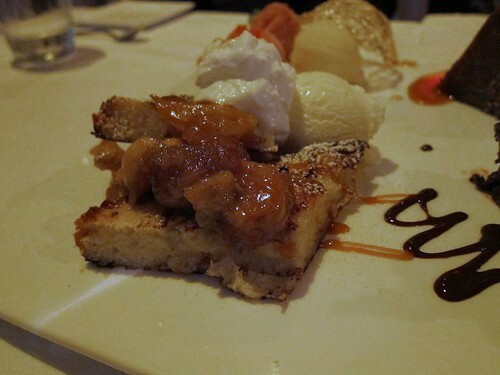 1) Medjool date cake, 2) Brioche french toast w/ brown sugar, braised pineapples, bananas. 3) Chocolate cake, 4)Sorbets: Strawberry, poached peach, lemon mango. 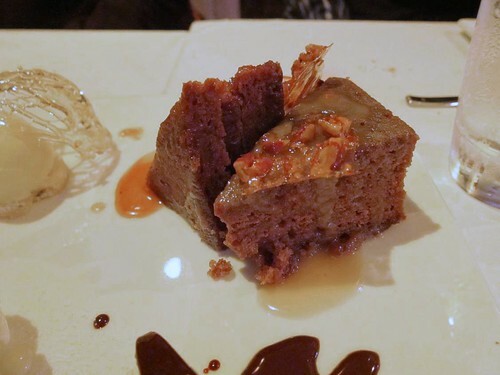 The date cake, dubbed "crack cake" by inomthings, was easily the table favorite. I also really liked the Brioche French Toast, especially the addition of the braised pineapples. The slight tartness from the pineapples really helped cut the richness of the french toast and made this exceed your usual french toast. Don & Christi came out after dinner to chat with us and shared a bit of their story. They're both so friendly and are such an adorable couple. Apparently if dining next to the water is not romantic enough for you, you can get a three course dinner from Don on a gondola! Disclaimer: This meal was hosted.